1940 Paper Mart was incorporated as a seller of paper and twine from a rented storefront at 54 Clinton Street in Newark, New Jersey. Herman Levey founded Paper Mart with his two eldest sons, Yale and Joseph. 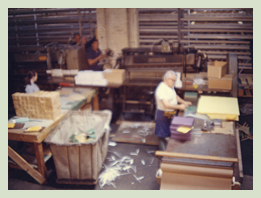 Their ultimate vision was to establish a company to serve the local printer in supplying paper and envelopes. The family worked diligently through the early 1940’s, while working two or three jobs just to support their young families. 1946 Myron Levey, Herman’s youngest son (then 19 years old), joined his brothers as an equal partner in the business after the untimely passing of Herman Levey. At that time, the brothers left their factory jobs and began to work full time at Paper Mart. 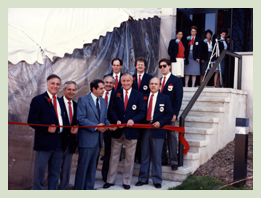 1947 Myron, while attending school at Rutgers Newark (NJ) in the evenings, began applying new ideas and strategies to procure customers and new paper mill franchises. 1949 Paper Mart purchased a three story building on Boston Street in Newark, shifting the company into second gear. With Myron and Yale both selling and building a new customer base, Paper Mart continued to expand. A second building was purchased nearby and new employees were hired. By the mid-1950s, a third building was added and sales were growing 30% a year. 1964 With the passing of Yale Levey, Myron was voted president of the company and Yale’s son Perry, age 25, joined his uncles as a shareholder and officer in the company. Perry, like his other cousins, all had worked at the company since age 14. 1965-1968 With relatives, cousins, and nephews all working at strategic jobs in sales, customer service and fiscal responsibilities the company continued sustained growth. The industry took notice that here was a hard working family with superior knowledge of products and applications. 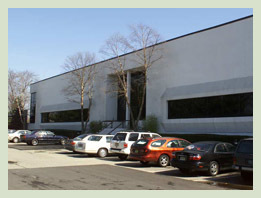 1969 Paper Mart builds a state of the art 52,000 sq ft distribution facility in suburban Livingston, New Jersey on 3.5 acres, which became one of the most modern paper distributing facilities in the Northeast. 1970-1984 Growth continued as Paper Mart’s philosophy coupled with expanding physical facilities proved a successful formula. Paper Mart, now serving 4 states opens an in-plant trade protected envelope print shop, established custom stocking programs and purchases new paper cutters, folders and electric fork lift trucks. Paper Mart’s growth rate continues at a 20% rate and outperforms cyclical changes in the paper industry. 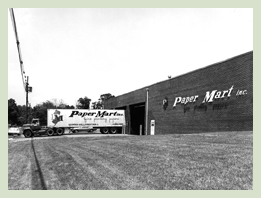 1985 Paper Mart quadruples its operating capacity by relocating to a sprawling 200,000 sq ft facility in East Hanover, New Jersey. The Company begins to operate 24 hours a day and employs in excess of 130 full time men and women becoming one of the strongest independent paper merchants in the United States. 1987 Paper Mart mourns the unexpected loss of Perry Levey at the age of 49. 1991 Paper Mart introduces the sale of paper and envelopes that are manufactured with recycled content to the market; the Company being one of the first merchants to recognize the importance of the new trend in the industry. Educating ourselves and in turn our customers in post-consumer content becomes a main focus for Paper Mart. 1992 Paper Mart introduces the “Authorization to Stock” program allowing our customers to utilize Paper Mart’s expansive warehousing facilities and expertise to source and store customer specific products allowing for guaranteed next day delivery as well as allowing our customers to avoid special ordering. 1995 Paper Mart mourns the loss of former original owner Joseph Levey at the age of 76. Recognizing the Paper needs of the local community, Paper Mart opens a 4,000 sq ft retail outlet supported by their 200,000 sq ft warehouse. Paper Mart recognizes another new trend in the industry and moves to the cutting edge in stocking and educating our customers in the world of digital papers with the launch of the “Digital @ Paper Mart” program. 1996 Paper Mart recognizes the power of the internet and launches papermartonline.com, a business to consumer website. 1999 Paper Mart enhances their printing division with the addition of new equipment including a “Super Jet Plus” press allowing Paper Mart to print envelopes larger than 10 x 13 including Tyvek and Expansion envelopes. 3 Ryobi sheet presses are also acquired to compliment the 8 envelope presses already printing upwards of 1.5 million impressions per day. During this time Paper Mart also enhanced the finishing department by acquiring a “Rollem” microperfing unit as well as a 12 x 18 folding machine. 2001 Paper Mart branches out its online presence with its first corporate website. This website includes company information, product information, as well as many resources including glossary of terms, paper and envelope information, guides, and charts. 2004 Paper Mart’s printing facility incorporates a state of the art direct to plate system adding increased quality to satisfy the needs of the print industry. Paper Mart updates their corporate website and E-commerce capabilities. 2007 Paper Mart obtains a Chain of Custody certificate authorizing Paper Mart to sell FSC paper products. Paper Mart is now officially able to certify to our customers that FSC products we secure from our certified manufacturers meet the Forest Products producers FSC standards. 2009 In October of 2009, Myron elected Jerry as President and CEO to lead Paper Mart, along with Jerry’s brothers, Howard and Jonathan, to a successful future. 2010 Paper Mart’s is excited to be able to grow with Mohawk Fine Papers by enhancing our product offering with the addition of Strathmore Writing and Script Papers. Paper Mart upgrades their Enterprise Resource Planning (ERP) system allowing for a more streamlined operation. Jason Levey, Myron’s grandson and fourth generation family member, joins the Paper Mart team offering a unique perspective on modern business practices and sets goals to modernize the Paper Mart brand in addition to enhancing customer relations through the use of technology. 2011 Paper Mart rebrands their retail store to “The Paper Mart Store” in order to maintain consistency throughout their different sales channels. To mark this change, for the first time in Paper Mart history, Paper Mart produces a television commercial. In April, Paper Mart mourns the passing of Myron Levey at the age of 82. With the succession plan in place, Third and fourth generation family members seamlessly step up to manage the company – upholding the values that Myron established over 50 years ago. 2012 Paper Mart rounds out its strategic marketing mix with the addition of social media. Used in conjunction with print media, it promises to be a powerful tool. Paper Mart is approved by the State of New Jersey Motor Vehicle Commission (NJMVC) and NIC as an authorized vendor of the paper used for the eTemp Registration Tag System. 2013 Paper Mart notes the importance of the environmental dexterity in the Paper Industry and recognizes that this topic needs to be articulated. With the initial presentation in April, 2013, Paper Mart intends to host annual meetings to endorse the integrity of the Paper Industry with the intention of dismissing the myths of paper’s negative impact on the environment. Paper Mart reaches milestone in upholding its 2013 Environmental Action Plan as 12 additional trucks are equipped with (SCR) Selective Catalytic Reduction system, a strategic emission control technology. Paper Mart’s printing facility integrates the Lotem 400® Quantum plate setter. This ultimate computer-to-plate (CTP) device offers superb quality and high productivity to assist Paper Mart in satisfying the needs of the printing industry. 2014 Paper Mart launches NEW! FREE MOBILE APP, The Paper & Envelope Resource Guide. The APP is compatible with any iOS or Android device. 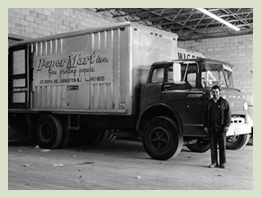 2015 Incorporated in 1940, Paper Mart celebrates a major milestone, 75-years of leadership and service. Paper Mart releases the first in a series of corporate videos, Printing at Paper Mart. Paper Mart initiates an Employee-of-the-Month Program to recognize and acknowledge our employee’s individual contributions as they relate to the overall objectives, priorities and the effective operation of Paper Mart. Paper Mart hosts Postal Boot Camp on May 5th, 2015. 2016-17 Like all revolutions, the ‘Digital Revolution’ is creating change and thus opportunity in the printing industry. In just a few short years, digital printing has gone from an emerging to an established technology. The advantages of digital printing have magnified with the advancements in quality production, economics, widespread application, and available media. As a result, the ability to execute short run, quick turn printed communication has new appeal. At Paper Mart, we recognize the changing environment and continue to research the opportunities created by the shift to digital printing technologies. As our Industry-leading partners continue to evolve and innovate, we are dedicated to providing our customers with solutions for continued growth and success. In addition to a growing portfolio of specialty items, new textures, increased weights, unique finishes and optimal B2 sizes, Paper Mart now offers a range of new products geared to a wide-range of ‘end-use’ applications. This diverse paper selection is timely as marketers realize the importance of media selection to print collateral and their overall campaign success. 2018 Michael Levey, a fourth generation family member, has joined the Paper Mart team. Michael brings 15 years of award-winning sales and PR/marketing leadership, setting goals to drive measurable sales growth through forward-thinking strategies and tactics. Michael’s Great Grandfather, Herman Levey, founded Paper Mart in 1939. Paper Mart is excited to announce the addition of 2-new vehicles to our 2018 fleet. The 2018 HINO 195 vehicles are equipped with a 3300lb. tuk-a-way lift-gates. As Paper Mart’s product offering becomes more diverse, the addition of these smaller, yet more versatile vehicles will allow Paper Mart to service customers more effectively.